This post is part of our ongoing series on running WordPress on Kubernetes. We’ve published a number of articles about running MySQL on Kubernetes for specific platforms and for specific use cases. If you are looking for a specific Kubernetes platform, check out these related articles. In the world of Kubernetes demos, WordPress is one of the canonical examples, but usually, the complexities of WordPress itself is just an afterthought. WordPress is just the container that we deploy to demonstrate some other capability, not a multifaceted application that needs to be deployed, scaled, backup up, and managed. For all the countless examples, rarely do they talk about what it means to run a multi-tenant WordPress environment from the perspective of a service provider selling WordPress sites for profit. The reason? Running a multi-tenant WordPress environment on Kubernetes is actually quite hard and these examples are designed to show simple things. So the complexity is swept under the rug. Today we discuss some of the hard problems you need to solve in order to run a multi-tenant WordPress deployment as a service provider. Portworx has a lot of experience helping hosting companies and other service providers run lots of WordPress sites for paying customers. This blog is a summary of that work. In these multi-tenant WordPress deployments, there are a few important capabilities that customers must achieve. It is important to host as many independent, isolated WordPress sites on the same host in order to maximize resource utilization and keep costs low. This means that often we need to have 100s of sites on a single server. If a WordPress site is consuming too many resources and harming the performance of other sites (i.e. the noisy neighbor problem), it must be easy to relocate that site to another host (or to move less resource intensive sites away leaving fewer sites on the host). It must be possible to independently backup a single WordPress site even if it is running on a host with dozens or hundreds of other sites. It must be possible to limit resource consumption at the site level and upsell additional resources to the end-customer. For example, if they need more storage, we should be able to “turn on” that feature easily. Fast “multi-writer” or “shared” volumes for file uploads needed as the WordPress PHP container is scaled horizontally. Without a solution for both MySQL and NFS-like file storage, a persistent storage solution for Kubernetes cannot claim to be able to handle WordPress workloads. But just persistent storage isn’t enough either. WordPress is said to run 28% of all websites on the Internet. That is a phenomenal installed base of some 75 million sites. While some of these are massive sites like TechCrunch or The New Yorker, the vast majority of WordPress sites are much smaller. That means as a WordPress hoster, your business probably follows the 80-20 rule. 80% of your revenue comes from 20% of your sites. Or said another way, 80% of your sites only account for 20% of your traffic. You need to provide a reliable service to a large number of low-traffic sites while minimizing infrastructure costs since your margins come in large part by placing more sites on the same physical infrastructure. You need to provide a white-glove, highly performant and reliable experience to a small number of sites that make up the bulk of your revenue. At the same time, you need a migration path for some sites to move from low-volume to high-volume plan, without disrupting the customer or your own internal operations teams. Let’s look at how Portworx solves these requirements in turn. As we have seen, each WordPress site requires 2 persistent volumes. One for MySQL, one for shared storage. A Linux host, however, is limited to 40 volumes maximum when using a solution like Amazon EBS or a traditional SAN. That means that unless you use the same volume for multiple sites, you are limited to 20 sites per host, no matter how large the host is. This is often the choice that WordPress hosters make, but what they gain in density, they lose in isolation. Since multiple sites share the same volumes, you cannot backup and restore only a single site as easily. We’ve just seen how Portworx can help service providers increase the density of their WordPress deployments while simplifying operations. Now let’s look at how hosters can solve one of the biggest problems in multi-tenant environments: noisy neighbors. If you categorically knew which 20% of your customers would account for 80% of your traffic at all times, solving the noisy neighbor problem would be a one-time migration. But, because traffic patterns change over time, this is a hard problem to solve. Portworx does a few critical things to help. 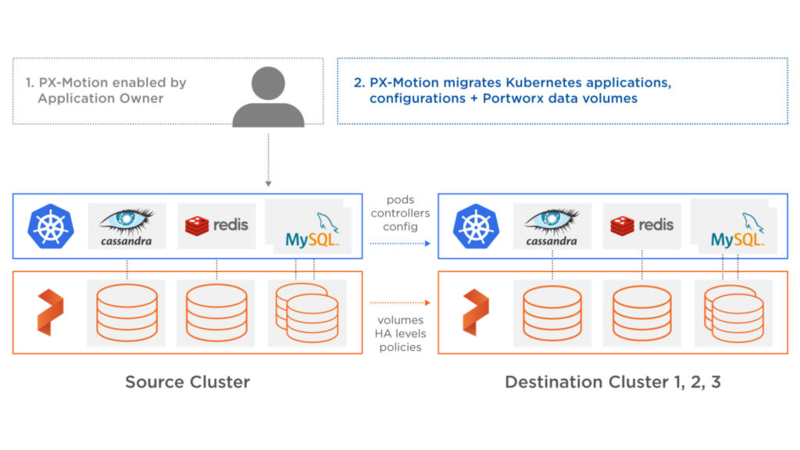 First, in addition to using Kubernetes to limit pod resources like Memory and CPU, you can use Portworx to automatically place different workloads on different storage hardware for different classes of service. For instance, you might sell your customers a premium “performance” plan if they are expecting heavy usage and they are performance sensitive. Alternatively, cost-conscious customers might opt for a “budget” plan that offers reliability but doesn’t guarantee blazing fast performance. On the backend, these plans can be mapped to Portworx “storage classes” that automatically place high-end plans on SSDs and low-end plans on HHDs. Additionally, since you don’t always know when one a customer site will suddenly experience a spike in traffic draining resources from neighbor sites, Portworx enables you to move applications between environments using PX-Motion. With PX-Motion you can move a single pod or group of pods to a different Kubernetes environment with a single command. Often a hosting customer will call their service provider the day before they are going to be on a national TV and say “I really need my site to work tomorrow.” This often leads to a lot of scrambling around and manual tuning, but with PX-Motion, moving the customer to an environment with more resources is as easy as kubectl apply -f wp-migration.yaml. The above described moving one heavy load site off a multi-tenant cluster. This is often the best option if you have some advance warning before a large traffic spike. However, in the middle of a large traffic event, it is often better to move low traffic sites away from the heavy traffic site, instead of vice versa. This is also possible with PX-Motion. Every WordPress hoster has heard this before. Accidents happen and when they do, your customer calls you, desperate. The problem for large multi-tenant environments is that true site-based isolation is difficult, especially if you have gotten past the 20-sites per host limit described above by pooling storage for multiple sites into the same volume. With Portworx, these limitations don’t apply. Each WordPress site gets its own MySQL and shared volumes, which can be fully and independently controlled, managed, snapshotted, backed up and migrated. For example, you can easily set up a backup policy that snapshots a single WordPress environment (MySQL and files) every hour and back it up to an object store. Then, if you get that frantic phone call from a customer, you can easily restore just their site, without affecting anyone else. Importantly, using Portworx 3DSnap, these snapshots of MySQL and WordPress files are application consistent, not just crash consistent, ensuring easy recover from backup. Now that we’ve looked at a high level at how Portworx helps service providers run large scale multi-tenant WordPress environment, let’s go a step deeper and look at how it works on Kubernetes. 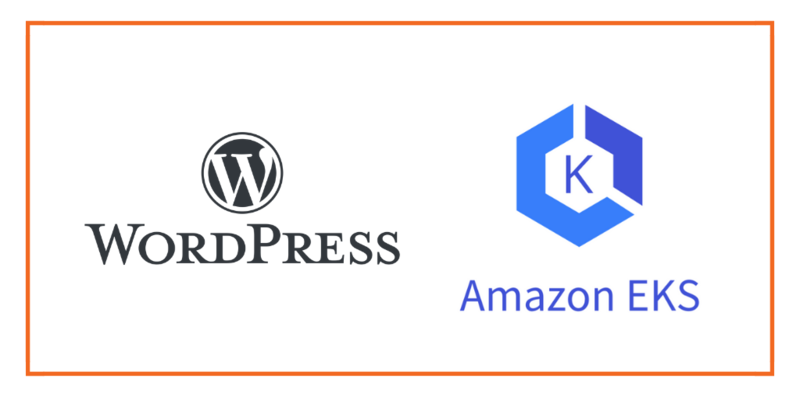 This post looks at how to run an HA WordPress on Amazon EKS, a managed Kubernetes offering from AWS, which makes it easy to create, configure, and manage a cluster of virtual machines that are preconfigured to run containerized applications. We have other blogs about how to run a similar setup on Azure AKS and Google GKE. Portworx is fully supported on Amazon EKS. Please follow the instructions to configure an Amazon EKS cluster. You should have a three node Kubernetes cluster deployed based on the default EKS configuration. Installing Portworx on Amazon EKS is not very different from installing it on a Kubernetes cluster setup through Kops. Portworx EKS documentation has the steps involved in running the Portworx cluster in a Kubernetes environment deployed in AWS. Portworx cluster needs to be up and running on EKS before proceeding to the next step. The kube-system namespace should have the Portworx pods in Running state. Once the EKS cluster is up and running, and Portworx is installed and configured, we will deploy a highly available MySQL database. Through storage class objects, an admin can define different classes of Portworx volumes that are offered in a cluster. These classes will be used during the dynamic provisioning of volumes. The Storage Class defines the replication factor, I/O profile (e.g., for a database or a CMS), and priority (e.g., SSD or HDD). These parameters impact the availability and throughput of workloads and can be specified for each volume. This is important because a production database will have different requirements than a development Jenkins cluster. In this example, the storage class that we deploy has a replication factor of 3 with I/O profile set to “db,” and priority set to “high.” This means that the storage will be optimized for low latency database workloads like MySQL and automatically placed on the highest performance storage available in the cluster. Notice that we also mention the filesystem, xfs in the storage class. We can now create a Persistent Volume Claim (PVC) based on the Storage Class. Thanks to dynamic provisioning, the claims will be created without explicitly provisioning Persistent Volume (PV). Finally, let’s create a MySQL instance as a Kubernetes deployment object. For simplicity’s sake, we will just be deploying a single MySQL pod. This is often sufficient for multi-tenant WordPress environments because each site is small and because Portworx provides synchronous replication for High Availability, a single MySQL instance might be the best deployment option for your MySQL database. Portworx can also provide backing volumes for multi-node MySQL clusters for your larger customers. The choice is yours. 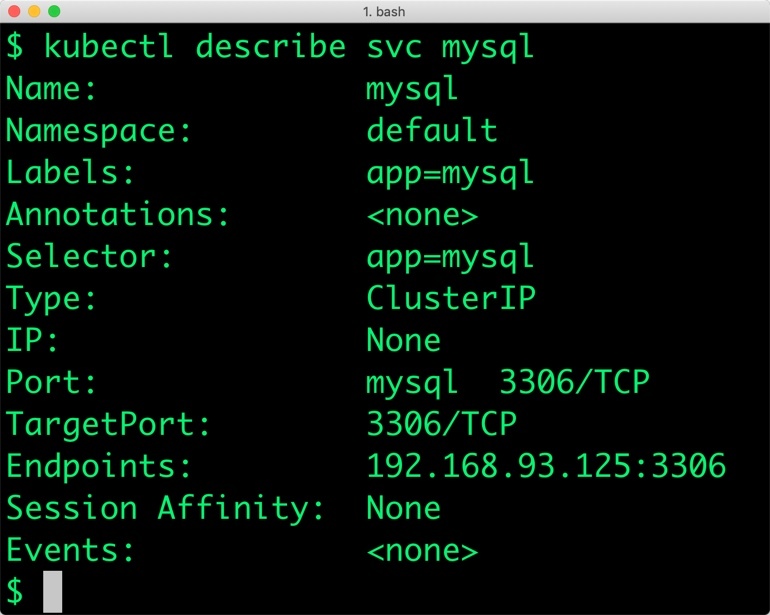 The MySQL deployment defined above is explicitly associated with the PVC, px-mysql-pvc created in the previous step. This deployment creates a single pod running MySQL backed by Portworx. 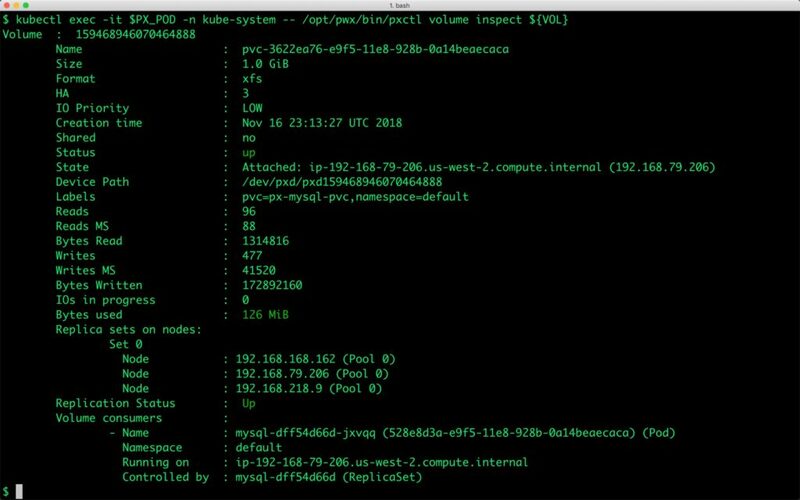 We can inspect the Portworx volume by accessing the pxctl tool running with the MySQL pod. The output from the above command confirms the creation of volumes that are backing MySQL database instance. To enable WordPress deployment to talk to the MySQL deployment, we need to expose it as a Kubernetes service. Since it is an internal service accessed by name, we will create a headless service that doesn’t assign an IP address. Refer to Kubernetes documentation for more details on the headless service. The YAML file below has the definition of MySQL headless service. Verify the creation of the service by describing it. Note that the ClusterIP doesn’t have an IP address assigned. The service points to a single MySQL pod that was created earlier. Unlike other workloads, the pods running WordPress share the storage backend. This enables different instances of WordPress deployed as pods access the same filesystem. Portworx has a concept of shared volumes in which multiple pods can share a common storage volume. A shared volume is declared as a part of the storage class. Additionally, we will specify an io_profile of “cms.”. This is useful for content management systems like WordPress and speeds up site performance by implementing an attribute cache. Let’s define a separate storage class for WordPress with a shared volume. We will now create a shared Persistent Volume Claim (PVC) based on the Storage Class that we defined earlier for WordPress. This PVC will be used by all the WordPress pods to store the shared content such as HTML, CSS, JPG etc. We will now have two PVCs associated with MySQL and WordPress deployments. We are now ready to deploy the WordPress instance that talks to MySQL. Create the following YAML file and submit it to Kubernetes through kubectl. Let’s verify that both MySQL and WordPress pods are up and running. Before accessing the web UI of WordPress, let’s make sure that the Apache server hosting WordPress is running. We can do that by checking the logs of the WordPress pod. In order to access the WordPress UI from the public Internet, we need to expose the deployment through a Kubernetes load balancer service. On EKS, the service will automatically create a Elastic Load Balancer (ELB) and shows the CNAME of the ELB. Let’s create the load balancer service to expose WordPress. EKS has initiated the creation of an ELB that points to the WordPress service. After a few minutes, you can access the WordPress web UI through the ELB from any browser. You can scale WordPress by adding more replicas to the deployment. Since all the WordPress pods share the common storage backend based on Portworx shared volume, the deployment can be easily scaled out. The MySQL deployment is configured to be in HA mode. For details on how to perform failover, a dynamic expansion the volumes, and configuring snapshots, refer to the tutorial on running HA MySQL on EKS. Portworx can easily be deployed on Amazon EKS to run stateful workloads in production. It is an ideal storage platform for transactional databases such as MySQL and read-intensive applications such as WordPress. Through the integration of STORK, DevOps and StorageOps teams can seamlessly run highly-available workloads in EKS. They can perform traditional operations such as volume expansion, snapshots, and backup and recovery for cloud native applications.